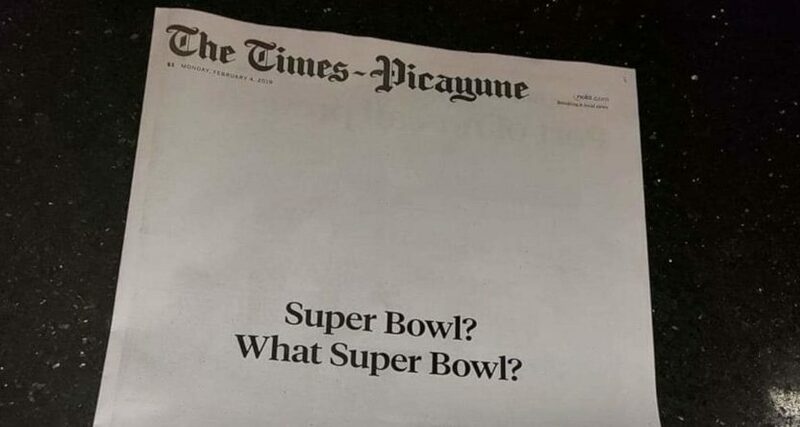 Saints fans weren't just flapping their gums when they said they would sit out the Super Bowl. New Orleans ranked DFL in the 56 metered markets with a 26.1 overnight, down 51% vs 2018 (53.0). Lowest rating for the DMA in Super Bowl history. New Orleans ranked dead last among the 56 metered markets for Sunday’s Super Bowl 53. Patriots-Rams scored a 26.1 rating in the market, down 51% from last year (53.0) and down 46% from 2017 (48.4). …Typically, New Orleans is one of the NFL’s strongest neutral markets. It ranked seventh for last year’s Super Bowl. Saints fans were incensed by a blown call in the NFC Championship Game, and talk of a Super Bowl boycott percolated throughout the two-week bye. Now that is some high-level pettiness, up there with Saints’ head coach Sean Payton wearing a t-shirt with an image of Roger Goodell with a clown nose to a season-ending press conference.